Brexit creates an opportunity for alternative European financial centres such as Frankfurt, Paris Luxembourg and Dublin. However, no comprehensive academic research on the emerging competition between European financial centres has been conducted. In order to fill this gap, I recently conducted extensive interviews with elite actors in two of Europe’s leading financial centres: Frankfurt and Paris. Below I outline some of the key observations from the fieldwork, conducted with Davide Schmid and Sean McDaniel, and indicate how the research might inform the debate on European finance after Brexit. The competition between Frankfurt and Paris is often presented as a ‘race’ between the German and French cities. But financial centres are not homogenous entities. They contain numerous actors with distinct business models and strategies. 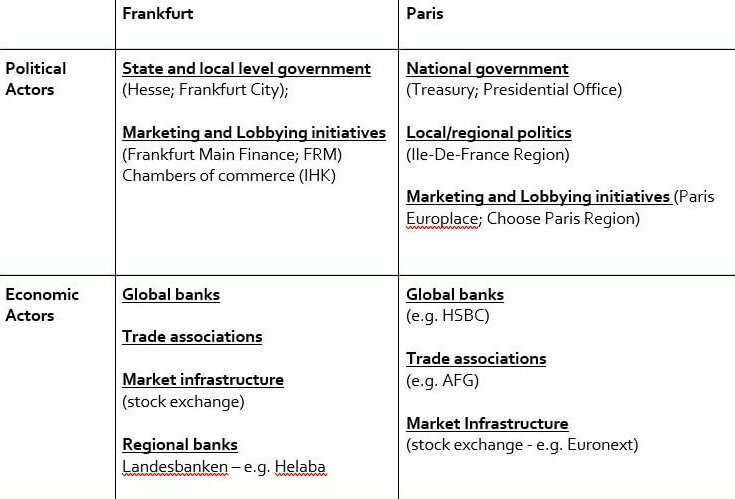 The first contribution of the research, outlined in the table below, is to disaggregate Frankfurt and Paris as financial centres. There is an important difference in how ‘political’ and ‘economic’ actors are positioning themselves in relation to Brexit. State actors – such as Frankfurt’s Hesse state government and the French Treasury – have a clear incentive to boost tax revenues and employment within their respective territories. Our research identifies well-coordinated networks of actors seeking to promote each city, headed up by marketing agencies such as Frankfurt Main Finance and Paris Europlace. In contrast, market participants such as global banks and market infrastructure providers (stock exchanges) are primarily concerned with minimising transaction costs and uncertainty after Brexit. The calculations and strategic positioning of political and economic actors therefore varies markedly within both financial centres. The research also underscores the enduring importance of territory in shaping the emergent competition between European financial centres. In the ’heyday’ of globalisation in the 1990s and early 2000s, many commentators assumed that transnational financial integration was eroding the significance of the nation state. Our research challenges this assumption. Territory continues to matter hugely in the emerging competition between European financial centres after Brexit. Both Frankfurt and Paris play host to important European supervisory and regulatory agencies – such as the ECB, EIOPA and the Bundesbank in the former and ESMA and the EBA in the latter. The presence of these agencies within each city generates a broader ‘ecosystem’ which financial firms find attractive. Marketing agencies have latched onto this in their campaigns to promote Frankfurt and Paris. Some banking institutions – such as the Helaba Landesbank in Frankfurt – have business models deeply integrated into their regional economy. This means that they have an incentive to boost their local territory. In addition, each city has distinct banking and capital market regulators – ‘national competent authorities’, such as the Bundesbank in Frankfurt and the AMF in Paris – charged with ensuring the stability of their domestic financial systems. The reliability of these regulators – often contrasted with supposedly less scrupulous regulators – plays an important role in each financial centre’s attempt to boost its business activity after Brexit. A further perception which our research challenges is the idea that finance always pushes for ‘deregulation’ and low supervisory standards. Rather than seeking to secure the ‘lightest’ regulatory environment after Brexit, financial actors often place a premium on the stability and predictability associated with their ‘tough’ national regulators. As one of our interviewees – an official from the Frankfurt office of a US bank – put it, ’when you’re going through a process of political instability – which is what Brexit injects into the equation – there’s a natural tendency to not look for the next ‘cool deal’… you’re looking for stability and clarity’. This premium placed on ‘stability’ was evident across our interviews. National politicians and regulators within Frankfurt and Paris are responding to this call. Brexit generates the threat of ‘regulatory arbitrage’. This is where national regulators, in concert with politicians, loosely apply EU supervisory standards in order to induce investment. In response, numerous interviewees – in particular from Paris – cited the importance of strengthening the power of EU supervisors such as ESMA in order to create a ‘level playing field’. Far from producing a regulatory ‘race to the bottom’, our research suggests that powerful actors within alternative European financial centres are utilising Brexit to toughen up regulatory standards and to transfer supervisory powers to the EU level. A further observation from our research is that ‘path dependencies’ – deeply entrenched links between actors and institutions – will play a key role in shaping the competition between European financial centres after Brexit. The ‘race’ didn’t begin in June 2016. Historical linkages and comparative advantages will also be key in shaping the future trajectory of European finance. This can be seen in the deep ties which link together global financial institutions with specific financial centres on the European continent. HSBC has a long-standing presence in Paris; Japanese banks have close ties with Frankfurt; US investment banks have deep historical associations with Dublin. This underlines the point that the ‘sales pitch’ from politicians and marketing agencies within Frankfurt and Paris can only partly explain possible re-locations after Brexit. Long-standing linkages will also shape future investment patterns. It is understandable why many look to Frankfurt or Paris as the obvious beneficiaries of Brexit. But an important observation from our research is that the emerging ‘competition’ between financial centres is not taking place solely between financial centres on the European continent. Many of our interviewees pointed out that if the EU loses its financial competitiveness after Brexit, business could simply leave the single market altogether and relocate to New York or East Asia. One factor regularly highlighted in this regard was the under-developed nature of European capital markets which Brexit threatens to fragment further. It is therefore important to place the emerging competition between European financial centre in global perspective. Brexit is unlikely to fundamentally undermine the City of London’s position as Europe’s pre-eminent financial centre. But important changes are nevertheless afoot in Frankfurt and Paris, as political actors, marketing agencies and private financial interests seek to ‘capitalise’ on the fall-out of Brexit. Our research provides an early indication of the strategic positioning of these actors a year before the UK’s official exit. Tracing the evolution of these strategies will be an important area for future research as the dust settles on the Brexit ‘deal’ and the shape of the UK’s regulatory decoupling from the European financial market becomes clearer. This blog was first published on The UK in a Changing Europe website.